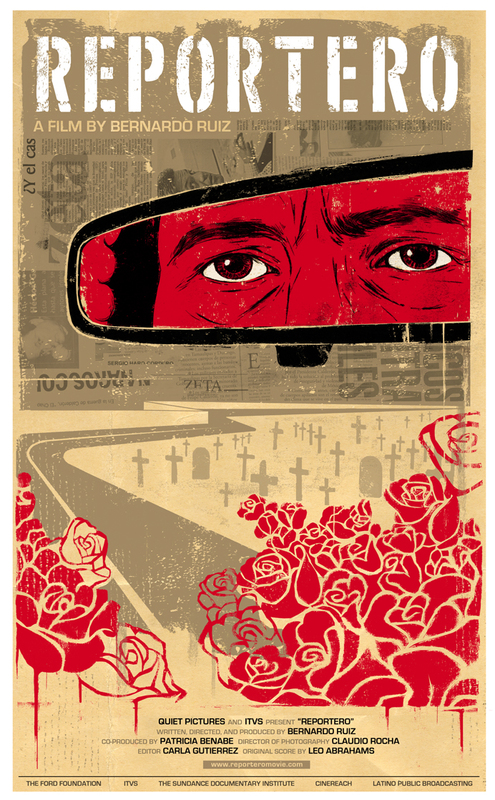 During the height of media repression in 1980, Jesus Blancornelas, a defiant journalist who was fired from a number of media outlets for refusing to be stifled, independently founded the Tijuana based newsweekly, Zeta – which to this day boldly stands by its mission of exposing Mexico’s wrongdoings and reporting what they see no matter the cost. Sadly, such fastening to ideals has meant the loss of members in their tight-knit family of reporters who have been killed in retaliation by criminal gangs. The paper, whose tagline is “Libre Como El Viento (free like the wind), is at the center of a brand new documentary, Reportero, which begs serious attention to the persecution of journalists in conflict ridden zones, like Mexico, where investigative reporting is critical. As director Bernardo Ruiz, who previously made the PBS Roberto Clemente story, follows true blue, ace journalist, Sergio Haro tackling and breaking risky news stories, we witness the personal drive and psychological toll that such a high stakes pursuit begets. The film sheds light on the fascinating history of the paper and elicits a powerful respect for the courageous reporters committed to carrying on Blancornelas’s hard investigative legacy. Last week Reportero had its world bow at Ambulante in Mexico City where it was followed by lively discussions about the safety of journalists. 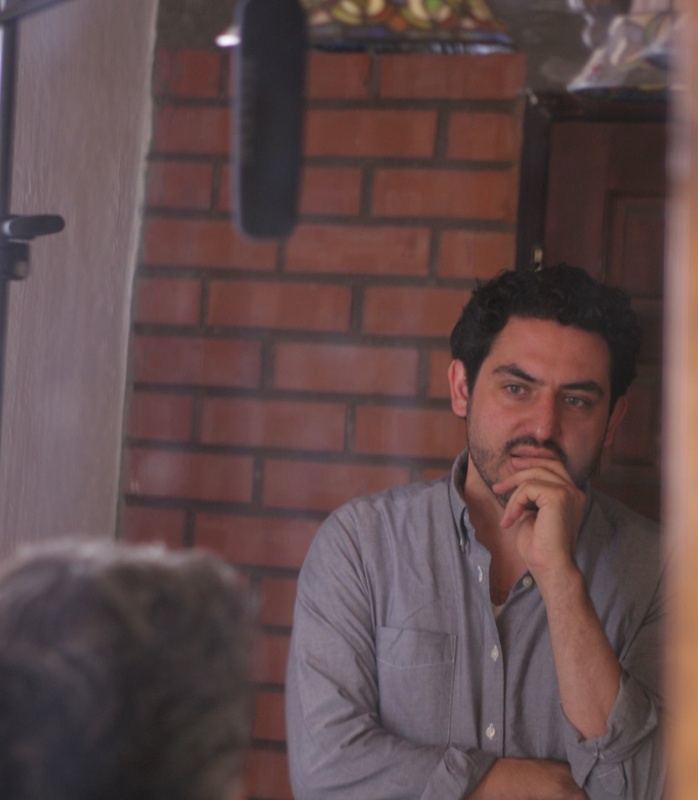 Five years in the making, Bernardo Ruiz deserves big props for undertaking this urgent, issue -oriented documentary, and for connecting us with the real heroes and their day to day quest for journalistic integrity. All of which underlines the sore need of protecting the freedom of the press in Mexico for papers like Zeta who actually and fiercely practice their right, at their own risk. 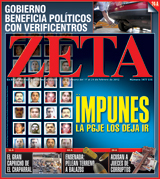 CD: Briefly what motivated you to make this project, and what made you decide to focus on Zeta magazine ( as opposed to other print media in the country like say, El Diario de Juarez which in 2010 after suffering the loss of two journalists made an audacious move by publishing a public appeal to the ‘de facto’ authorities (read: narcos) regarding what they should and not cover in order to prevent any more colleagues’ deaths). BR: I actually didn’t set out to make a film about Mexican journalists. I was researching stories in the Mexicali-Calexico border region. Starting in 2007, I began thinking about creating a multi-character portrait of the region — to look at how interconnected lives are across this slice of the border which generally doesn’t get a lot of attention. During one of my research trips, I met the director of a youth shelter who suggested I talk to a local journalist from Mexicali. About 6 months later I met Sergio Haro at a Starbucks on the Mexican side of the border. What was supposed to be a short meeting turned into a 3-hour discussion. I left the meeting thinking that Sergio’s story was much more urgent than the regional portrait I had originally envisioned. In that meeting, Sergio told me that he worked for Semanario Zeta, the Tijuana-based muckraking weekly, and I dove right in. At a certain point, telling Sergio’s story, telling Zeta’s story felt almost inevitable. CD: How did Sundance Institute help your project? The Sundance Documentary Feature Program supported me with a research and development grant very early in the process, when the film was still a portrait of the Mexicali-Calexico border region. R&D support is always the hardest support to get (at least in my experience) and the support allowed me to push forward with the research at a time when the story was evolving. Much later, when I had an assembly of the film, I participated in the Composer’s and Story Lab. My editor, the ultra-talented Carla Gutierrez, and I had reached a plateau with the story. The lab was a chance for me to step back from the film and evaluate it with fresh eyes. The timing worked out perfectly — we took a break from editing and I had a week of thinking about score and story with the Sundance advisors. CD: Sergio Haro is such a great character, intelligent, tenacious and all around straight shooter. But I’m also really happy your documentary features the woman behind the operation, Adela Navarro, who was recently awarded with International Women’s Media Foundation’s, Journalism in Courage Award. What was it like working with her on the documentary? BR: The film is as much Adela Navarro’s as it is Sergio’s. She came to the paper straight out of college. She and two other female editors came up under Jesus Blancornelas, the paper’s founder, in a very tough, sink-or-swim atmosphere. 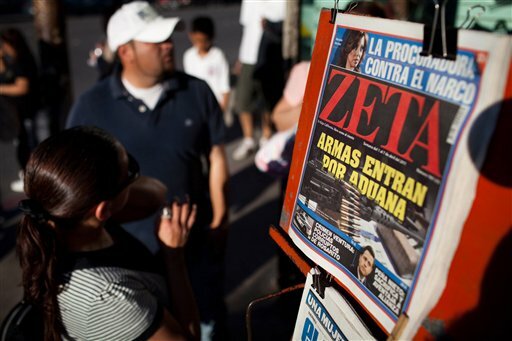 After the murder of a Zeta editor, Francisco Ortiz in June of 2004, who was gunned down on a Tijuana street in front of his children, two male editors left Zeta. “They left a day after the assassination,” Adela explained to me recently. The women are the ones who stayed to run the paper. As Sergio’s boss (one of a small number of female editors in Mexico) Adela has strengthened the newspaper’s brand of aggressive investigative journalism since 2006, when Blancornelas died. 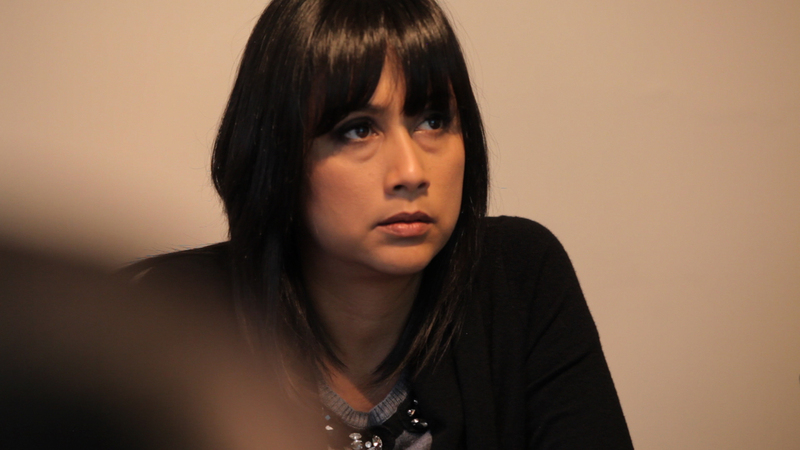 For me, she is an undeniably compelling and dynamic presence in the film. She was understandably protective of her staff and her paper at first. Over time, she opened up. I think her strength, intelligence and absolute commitment to her work come through in the film. CD: The magazine’s complicated relationship with the local government of Tijuana is heavy. The film talks about the controversial, high profile politician and sports betting magnate, Jorge Hank Rhon, the town’s mayor from 2004-2007, whose influence runs deep, and more and more wide. Did you try getting an interview with him for this film? Did you ever feel you had to also take certain safety precautions in the making of the film, simply by aligning yourself with the magazine’s open policy? BR: Every week, since 1988, Zeta has been publishing a “black page” with Hector Felix Miranda “El Gato’s” image pointing at the reader. The memorial page asks Jorge Hank Rhon, in bold type, “Why did your bodyguard Antonio Vera Palestina kill me?” It accuses the sitting governor of Baja California, and his predecessors, of doing nothing to pursue those who ordered Félix Miranda’s murder. U.S. papers would probably balk at doing something like this – then again, most U.S. papers haven’t buried as many of their reporters as Zeta has. I didn’t pursue an interview with Hank, because I don’t see REPORTERO as a work of traditional journalism where the default approach is to get “both sides”. Instead, I felt like the facts of what happened in “El Gato’s” murder as well as the archival interviews with Hank tell enough of a story. The information is there, and the viewer can decide what to believe. CD: The documentary serves as a great forum for critical discussion regarding freedom of the press and safety concerns for journalists worldwide – what in your opinion and insight gleaned from your research, is needed from a social activist POV by the public who see it and want to support and protect journalists in Mexico? CC: Where can we see the film? BR: The film premiered in Mexico City last week through Ambulante, which is an amazing itinerant festival. We packed our two Mexico City screenings to overflow. 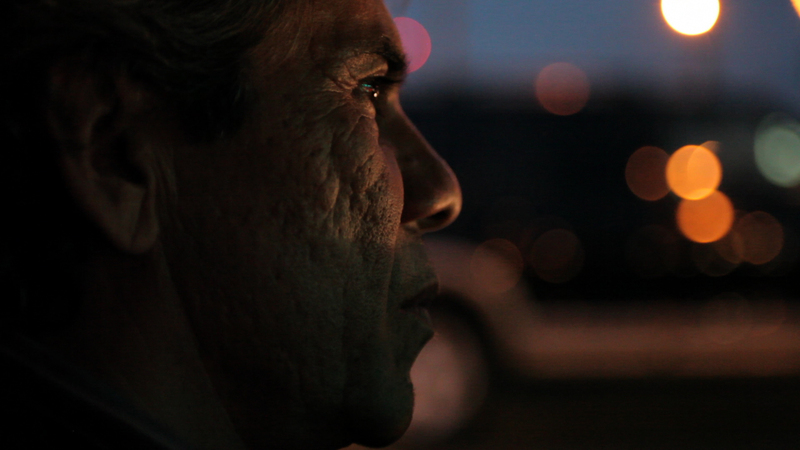 Reportero tours with the festival, screening in 12 Mexican cities. Later this year, we air on POV (PBS) in September 2012. We are right in the middle of determining where our US premiere will be.